37 1/4 by 77 3/4 in. 94.6 by 197.5 cm. 15 by 20 by 6 in. 38.1 by 50.8 by 15.2 cm. 48 1/8 by 48 1/4 in. 122.2 by 122.6 cm. Mitchell-Innes & Nash is pleased to present Alexander Liberman: After Image, Paintings and Sculpture from the 1950s, on view in the Uptown gallery September 24 – October 26. This exhibition will focus on Liberman’s mid-century painting and pedestal sculpture, including several works that are being exhibited for the first time in decades. 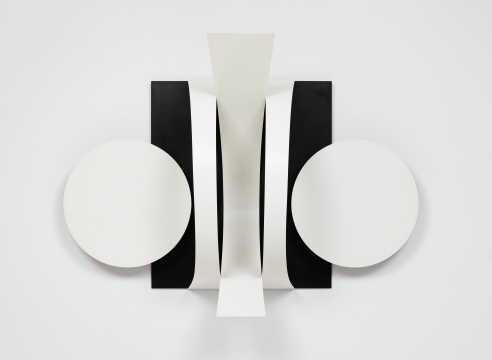 The 1950s are considered to be Liberman’s most significant period, as he continued to refine the signature hard-edged, geometric style that he had developed in the previous decade. With their industrial enamel and stainless steel, Liberman’s hard-edge circle paintings and sculptures prefigured Minimalism in many ways, created as they were without emphasis on expression or the artist’s hand. The work looked ahead to a time when machine-made art was routine. Liberman was keenly interested in exploring negation of traditional composition and the subject, eschewing any reference to images in his painting. His own term for this set of ideas was “after image,” a term referring to both non-objective painting as well as the optical effects of looking at his paintings. Liberman sought to make art that was clear, legible and direct. Alexander Liberman (1912-1999) was born in Russia and lived in London and Paris before emigrating to New York in 1941. While in Paris, Liberman worked at Vu magazine with photographers including Andre Kertesz and Robert Capa. In New York, Liberman was the highly influential art director for Vogue, and later held the position of editorial director for all of Condé Nast publications for several decades. Liberman’s work is in the collection of many major U.S. museums, including the Museum of Modern Art; the Whitney Museum of American Art and the Metropolitan Museum in New York and the Corcoran Gallery of Art in Washington, D.C. His large-scale public sculptures are widely known with examples sited in cities around the world and in sculpture gardens including Storm King Art Center in Mountainville, NY; the Hirshhorn Museum and Sculpture Garden in Washington, DC; the Los Angeles County Museum of Art and the Laumeier Sculpture Park in St. Louis. 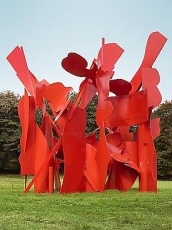 The Estate of Alexander Liberman is represented by Mitchell-Innes & Nash.